Originally from the Midlands, Degna Stone now lives in Tyne & Wear. She is a co-founder of Butcher’s Dog poetry magazine and a contributing editor at The Rialto. She holds an MA in Creative Writing from Newcastle University and received a Northern Writers Award in 2015. 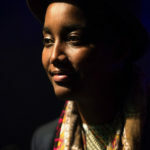 She has appeared at Durham Book Festival, StAnza International Poetry Festival, London Literature Festival and on BBC Radio 3s The Verb. She is supported by Peepal Tree Press’s Inscribe programme and is a fellow of The Complete Works III.